Conclusion: Housing data in the U.S. has stabilized on the back of record low mortgage rates, but reversion to the mean of long term rates and a massive shadow inventory combine to make a meaningful housing recovery potentially years away. That said, even a stable U.S. housing market is positive for the U.S. dollar. Our view of economic growth in the United States has been fairly obvious to those that have been reading our notes or met with us lately. Specifically, we think economic activity is going to be lower than consensus expectations. Of course, that is not to say that all is negative. In fact, a key area of the U.S. economy that appears to be showing some stabilization is housing. The housing market is important for two reasons. First, a house is the primary asset for many Americans. As the value of a house increases, so does their net worth, and their confidence related to future spending. 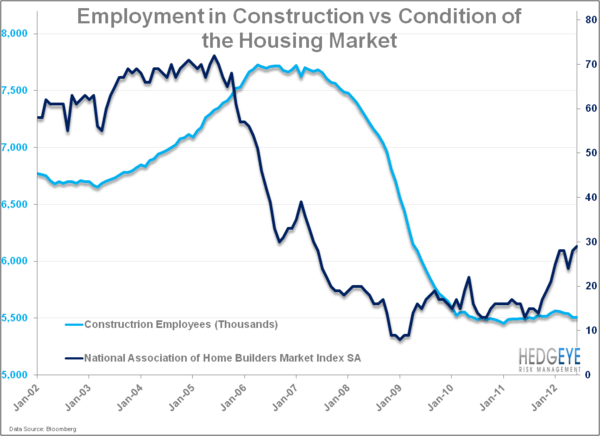 Second, homebuilding and construction is a major driver of employment in the U.S. As the chart below highlights, more than 2 million jobs were shed in the construction sector since 2006, of which almost none have come back. 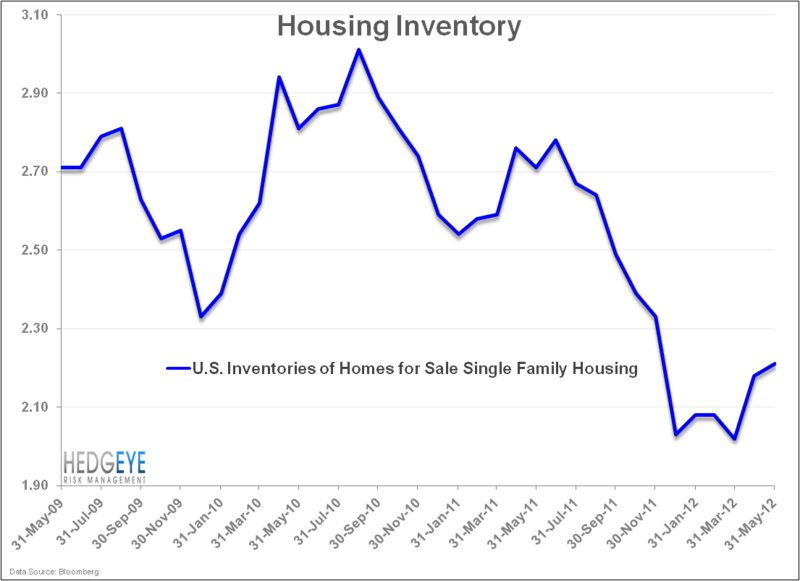 As it relates to housing stabilizing, inventory has been steadily coming down since about the middle of 2010 and although inventory has ticked up slightly in the last couple of months, it still remains well below cycle highs. The chart below highlights this trend. In fact, according to the National Association of Realtors, NAR, reported inventory decreased to 2.39 million units from 2.47 million in May. This is the lowest June inventory number since 2002. As the supply of homes for sales has declined, we have seen some uptick in prices both nationally and in specific markets over the past couple of months. 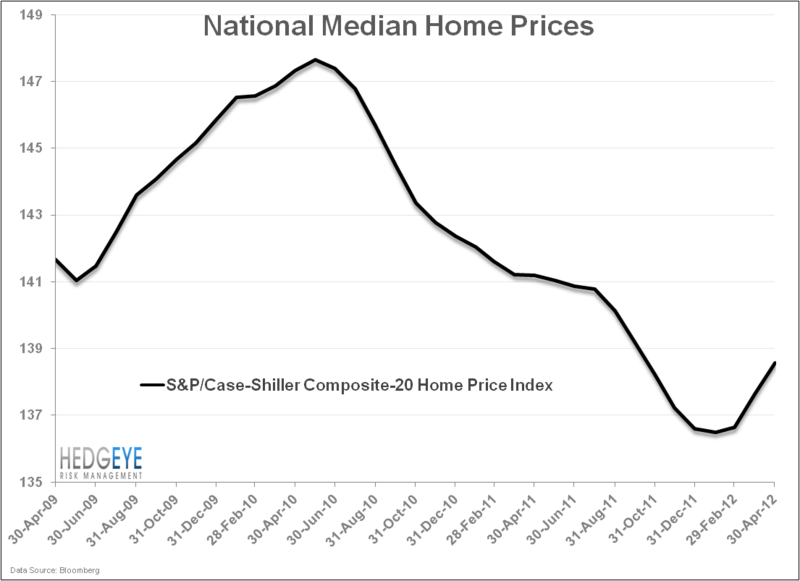 The chart below highlights the Case-Shiller national median home price going back three years. 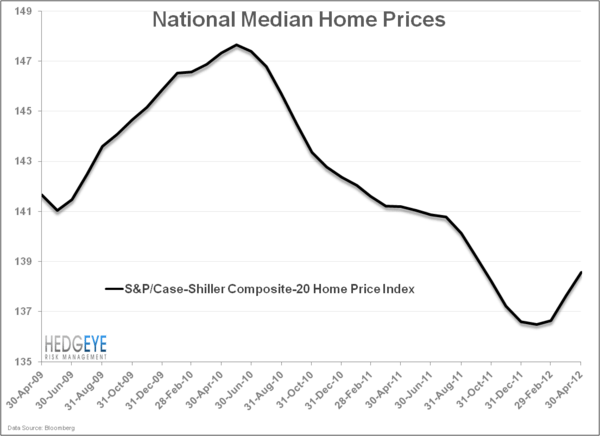 The national median home price, at least according to this series, bottomed in the first couple of months of 2012 and has been on the rebound for the last few months according to data through April. This is corroborated by data released from Zillow that shows the median home price nationwide was up 0.2% year-over-year in Q2 2012 for the first time in five years. Admittedly, though, the rebound in pricing has been modest at best. In April 2012, the median home price was $139K, which was only up a mere 1.5% from the trough number in January 2012. The prior low was nine years ago in January 2003. From the peak in April 2006, the median national home price is off by just under 33%. 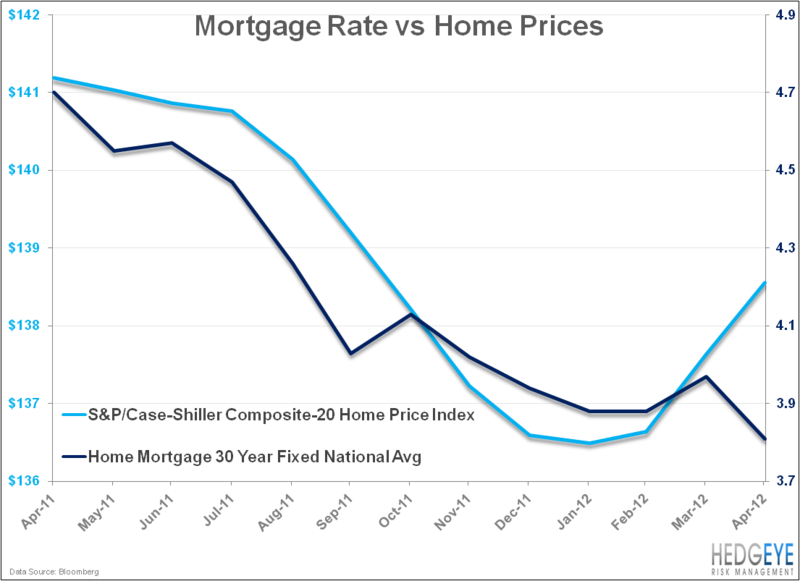 In part, the arrest in the decline in home prices is due to the fact that mortgage rates have reached all-time lows. 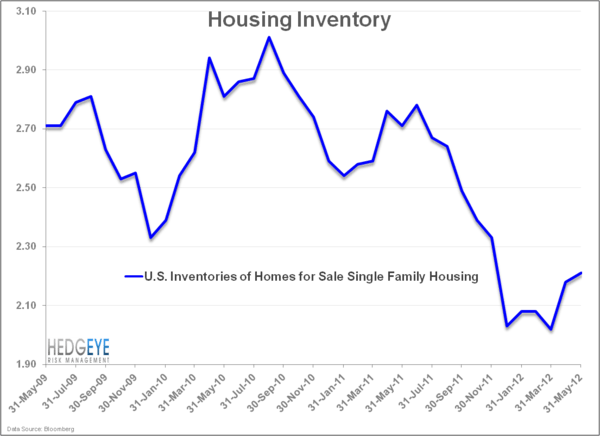 Specifically, the 30-year conventional mortgage rate in the United States has been declining for three straight years and is currently at, literally, its lowest rate ever. According to Bloomberg, the current national average mortgage rate is 3.59%; this is down more than 20% from year-ago mortgage levels. 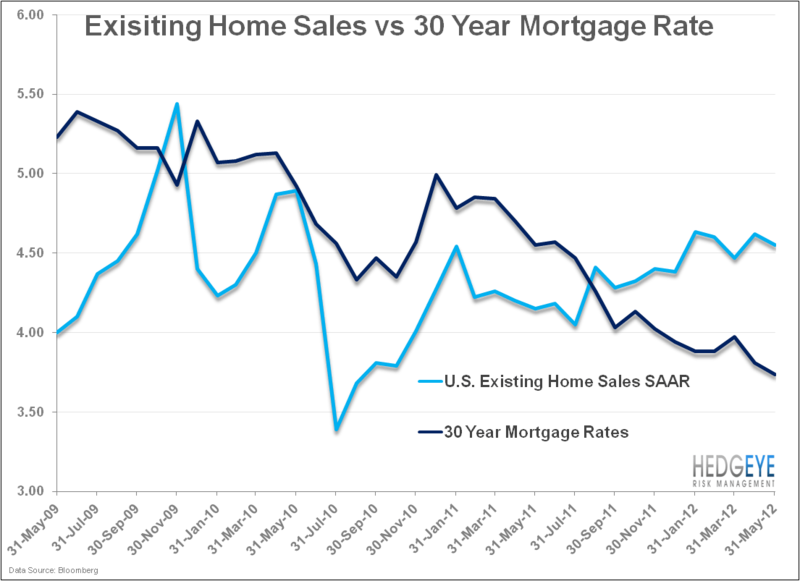 In the chart below, we compare U.S. existing home sales to the 30-year mortgage rate. Not surprisingly, in the last nine months we have seen an increase in U.S. existing home sales as mortgage rates have hit historic lows. This isn’t a surprise given that, all else equal, the decline in mortgage rates have led to mortgage payments that are 8% lower on a year-over-year basis. 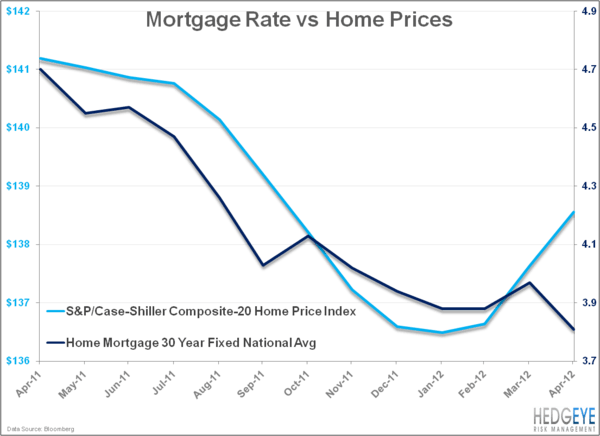 So demand for homes has increased as they have become cheaper based on financing rates, therefore home prices have ticked up. One of the key risks to the housing market over the long run is a reversion to the mean in long term rates. Over the past thirty years, the average rate on a 30-year mortgage is 8.75%. From the current mortgage rate, a one percent increase in the mortgage rate would lead to an increase in the monthly payment of roughly 10%. In the scenario that mortgages revert to the long run average, monthly payments would sky rocket by more than ~57%. 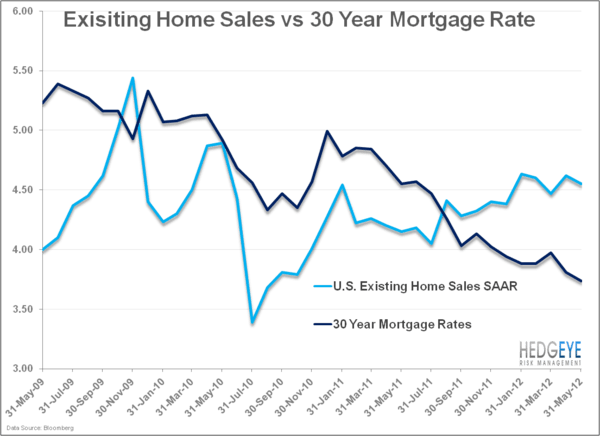 An increase in interest rates, even on the margin, is a key risk to any potential for stabilization in the U.S. housing market. The other key risk to the current stabilization in the housing market is shadow inventory. Broadly speaking, shadow inventory is defined as those mortgages that are more than 90 days delinquent on their mortgages, in default, and/or in modification. In the chart below, we highlight a data set from Bloomberg that indicates that shadow inventory in the U.S. is at north of 4 million units. Granted, shadow inventory has come down from its peak of more than 5 million units, the overhang remains massive. In fact, if we add shadow inventory to the actually reported inventory number from NAR, the total housing inventory in the U.S. is somewhere around ~6.5 million units. Based on NAR’s May adjusted annual rate of existing home sales in the U.S. of 4.55 million, this suggests almost sixteen months of inventory. At sixteen months, this would be higher than the peak of supply in 2008. Clearly, there has been some stabilization of the U.S. housing market. 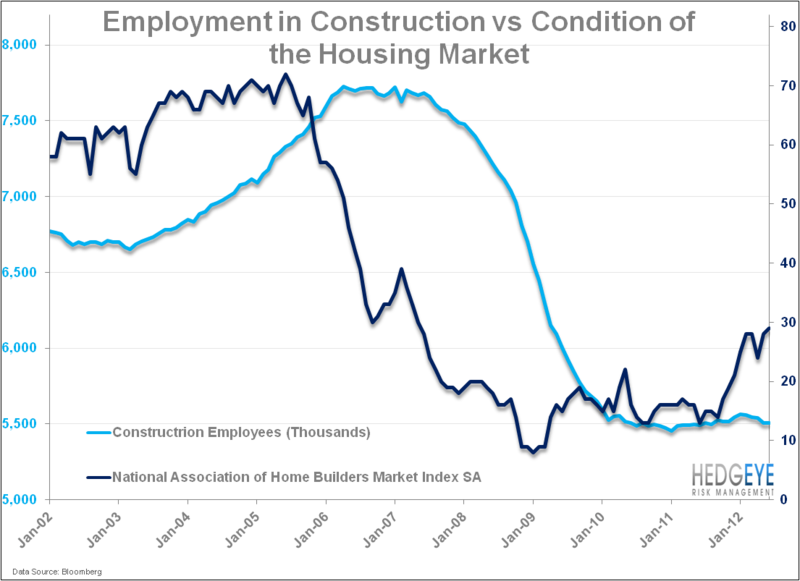 This stabilization is reflected in both the stock market, where the S&P Homebuilder Index is up 26% in the year-to-date, and amongst homebuilders as the National Association of Home Builders / Wells Fargo builder sentiment recently hit its highest reading since March 2007. Despite the enthusiasm of these two measures, we would caution on expecting an accelerating recovery from these levels because of both the large amount of shadow inventory and artificially low level of interest rates.